Since 9/11, we’ve had numerous requests for a patriotic themed gift. Our Patriot Eagle has been well-received and is the perfect gift idea or award for your favorite patriot, including police, fire and military. Anyone who loves our country – anyone who serves and protects will love this gift. 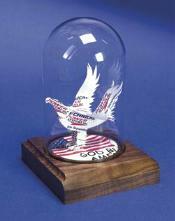 The Business Card Sculptures Patriot Eagle will be a cherished retirement, birthday or holiday gift! Celebrate the patriotism of co-workers, family, customers and friends. Great for awards programs or banquets. See more patriotic unique gifts for Americans when you check our Public Service Gifts category.